The political pros will say Mike Huckabee should have seen the storm coming. This is always how it goes for an underdog candidate who manages to rocket suddenly to the front of the presidential pack. His opponents turn nasty. His press bus fills with predators. And every minor flub shoots through the political heavens like a lightning bolt. Over the last week, the former Arkansas governor has been firing flashbulbs through that firmament. After the death of Pakistan's Benazir Bhutto, Huckabee appeared to misrepresent the state of martial law in her country. (It has been officially lifted, though he disputed the point.) He mistakenly said Pakistan shares its eastern border with Afghanistan. (It is the western border.) He said he had "spoken" with former U.N. Ambassador John Bolton about policy. (He had only emailed with him.) He said he extended his "apologies" to the Pakistani people. (He meant to say "sympathies.") Then, to top it all off, while calling for stricter border security in order to keep any Pakistani terrorists from coming into the U.S., he seriously overstated the number of illegal Pakistani immigrants in the country. On Monday, Huckabee committed another blunder at a press conference by screening a new attack ad against Romney for journalists, while announcing at the same time that he would not broadcast the piece on Iowa television. Claiming to have made the decision against airing the ad just moments earlier, Huckabee appeared surprised that anyone would see the move as a cynical  if not hypocritical  maneuver. But given the mores of the national political press, the surprise move and its unclear motivations seem certain to dominate the news cycle heading into New Year's, providing the wrong kind of press for Huckabee in these crucial final days. To his critics and the pundits, this is all evidence of Huckabee's lack of foreign policy experience and tenuous presidential timber. But behind the scenes, in the Huckabee campaign, the tragedy of errors points to something else entirely  a real lack of a campaign support staff that most of his competitors take for granted. For most of the year, the campaign has operated almost entirely on the talents and wit of its candidate, who has flown commercial airlines, written his own talking points and jokes, and worked 20-hour days. Lacking the teams of advisors that most candidates depend on, Huckabee now finds himself a first-tier candidate struggling with a second-tier operation. "We have 25 people. Everybody else has 100 people," says Ed Rollins, the veteran campaign consultant and Huckabee's campaign chair as of two weeks ago. "This was a candidate driven campaign with a very dedicated group of smart people. Now we just have to grow it so that it becomes a national campaign." But is it a litle late for that? With just days to the Iowa caucuses, and Huckabee polling in a dead heat with the well-funded Mitt Romney, time is short and the pressure is intense. The potential for slipups is increased by the fact that Huckabee depends heavily on the media to get his message out, forcing him to endure frequent interviews that will be combed over for any inaccuracy. At the same time, the Huckabee campaign has tried to slow down the candidate's daily schedule, from its recent swirl of fundraising events, town halls and cable television appearances. After months of composing the campaign message with little help, he now gets regular briefings about the world outside the campaign bubble, which he has little time to keep up with. "We are being much more careful now," Huckabee said, in an interview on his campaign bus Saturday here "If there is some breaking news, I am being pulled out of events to be sure that I know what may be happening." Back in early December, Huckabee had been asked about the new National Intelligence Estimate on Iran a full day after it was released; he had no idea it had even come out. Whatever the new procedures, Huckabee still lacks the basic building blocks that other campaigns take for granted. 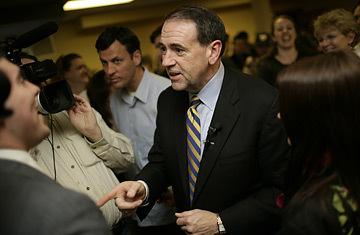 Few of Huckabee's domestic proposals, which he laid out in book he wrote himself, have been fleshed out in detail, with the notable exception of immigration, which is far more severe than his record as governor, including a call to set a 120-day deadline for illegal aliens to register and leave the country. He has only given one major speech on foreign policy, and he lacks a foreign policy advisory committee, though the campaign says one is being fast assembled. You can still count his major advisors on a single hand; in addition to Rollins, they include his campaign manager Chip Saltsman, the Arkansas businessman French Hill and his policy director Janice Cherry. But in spite of all those deficiencies, Huckabee has something that no other candidate on the Republican side, save perhaps John McCain, has been able to muster this cycle. With the training of a former Baptist pastor, he has an uncanny ability to move an audience, and a real talent for the endless drudgery of person-to-person retail campaigning. It is a talent that he has also used to his advantage with the media. At a press conference here on Saturday afternoon, reporters peppered Huckabee with questions about his repeated Pakistan gaffes. He responded in his trademark style, pivoting the issue away from his small mistakes to a larger, essential theme. "We're at a point in politics where everyone wants to say you made this little error here," he said, pinching his fingers together for emphasis. "The mistakes that I think you will find me making are going to be mistakes of a word here and a figure there, but not mistakes of the heart." As he tries to upgrade his campaign operations, the next few weeks and months will indeed test if his heart is in the right place. But when the history books are closed on the 2008 campaign, this one thing can surely be said for Huckabee: Win or lose, the other governor from Hope, Ark., ran a campaign that was almost entirely his own creation. Its strengths were his own strengths, and its weaknesses, very much in evidence in the last week, were his own as well.